The total solar eclipse in Oregon was an incredible thing to witness. I can easily say that watching totality was one of the most amazing scenes I have ever seen and experienced. It is hard to explain and put into words. But almost just as hard to show as photographs. The images I took barely do justice to the moment, but I really hope you enjoy them. 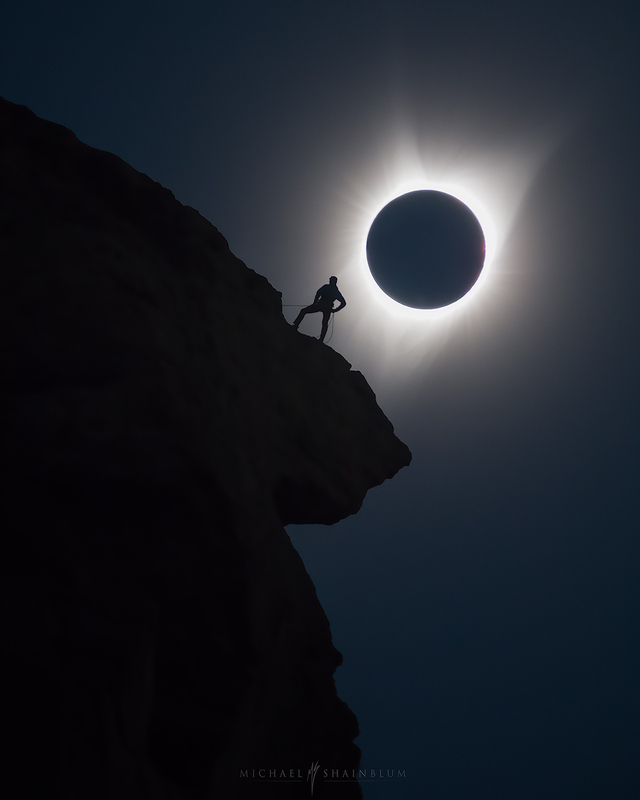 This image was taken right before totality. I was lucky enough to join my friend Andrew Studer and stay at his camp while he was out there working with Columbia Sports and planning out his Eclipse Shot. 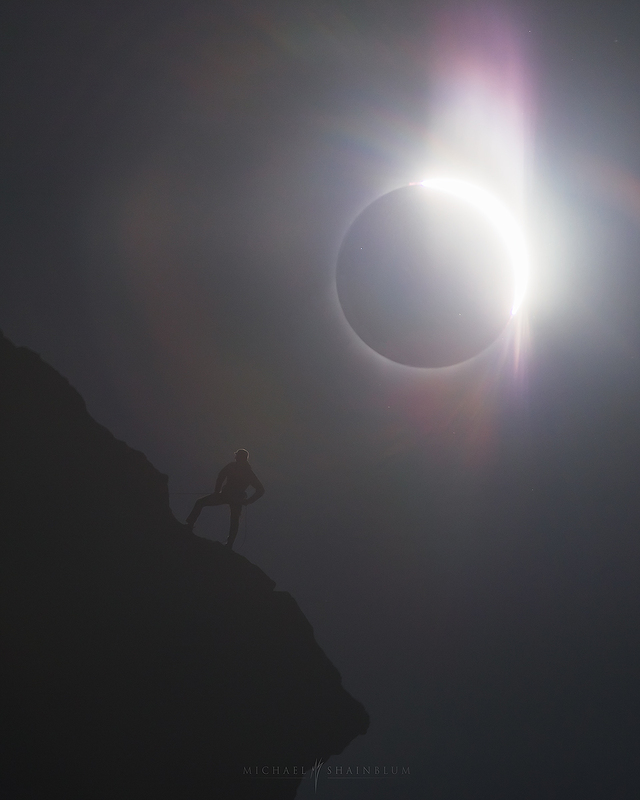 We met up with Ted Hesser a talented climbing/adventure photographer the morning of the Eclipse. 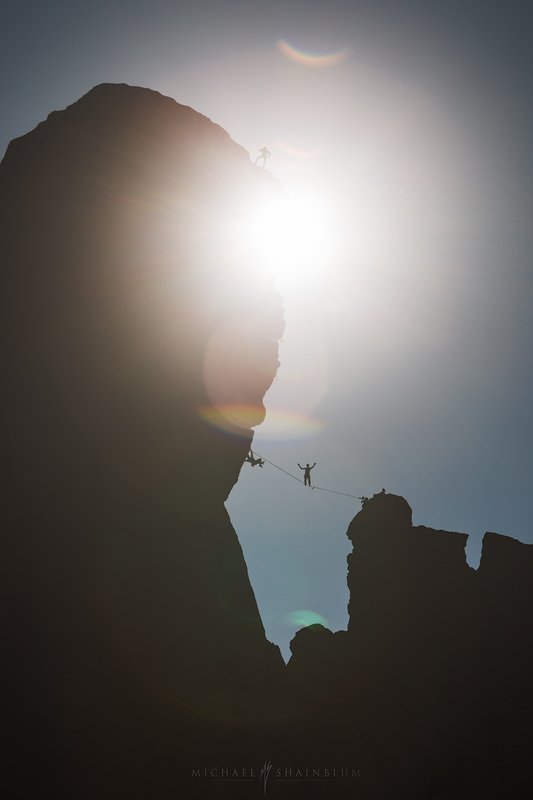 Ted, his girlfriend Martina Tibell and their friend Tommy Van Smith did a lot of planning and coordinated a climbing pose to take place during totality. We all met up at the spot fairly early and had some time to kill before the event. There were many filming and photography groups around the area all looking to capture some eclipse silhouette magic. The partial eclipse was quite a long period of time, every few minutes we would put on our glasses and see the sun with different ratios cut out. The sun looked cool through the glasses. But it was hard to fully appreciate what was happening. Once sun was almost completely blocked, we noticed the sky get darker and darker. Everything around us looked almost polarized. We were all in positions ready to shoot and then it happened. I took off my glasses and I was not prepared for the scene that unfolded. This video clip shows the moment right before I took the image above. I can not tell you how surreal it was to experience this moment. You can hear Ted Hesser on the walkie talkie, coordinating with the climber. To get the right position for his shot. As well as tons of camera clicks and people cheering from on top of the rocks. Here is an image from full totality, Showing a bit more of the rock formation. This is another image of full totality. For this image I cropped in and added a bit of contrast so the corona could be more visible. The glow was completely unreal. After full totality, the sun peaked back out and washed out the contrast quite a bit. You can see the crescent sun start to show on the edge of the moon. Before the total solar eclipse, I spent some time walking around to different spots, getting some angles of the climbers and sun. 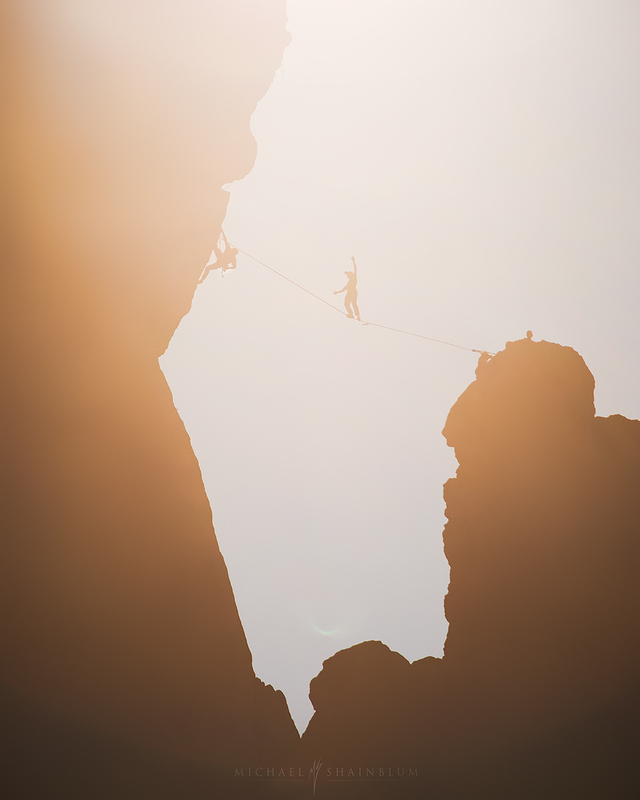 I believe the slackliners name is Ryan Robinson, who was being photographed by Chris Burkard. 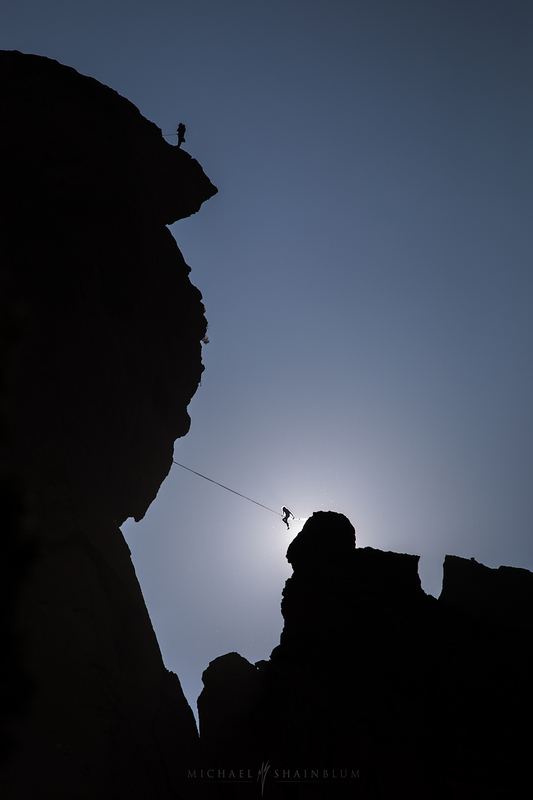 Another talented adventure photographer. Amazing set of images Michael! You’re so lucky to be able to witness and photograph the total eclipse! 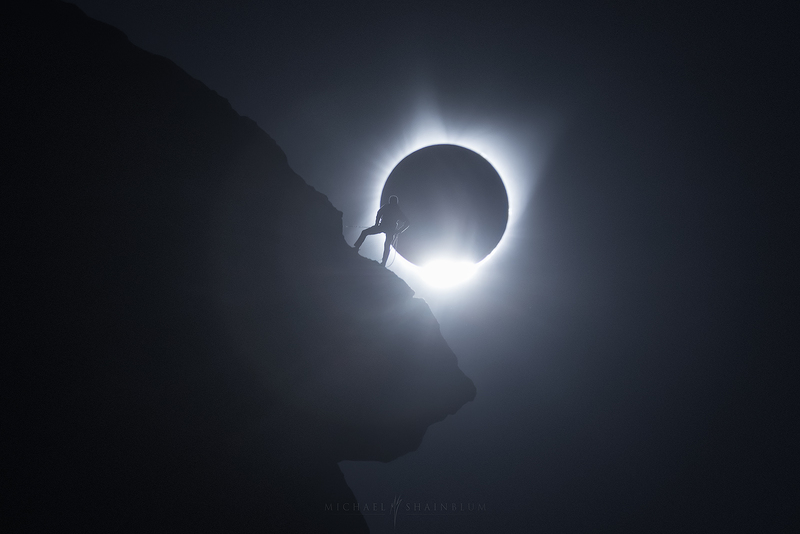 Yours and Andrew’s images are my favorite images I have seen from this year’s eclipse! The story you tell through your lens leaves lasting emotions in the viewer. Thank you for sharing your talent and passion with the world! Marvelous photographs, Michael. Your short video clip with Ted talking to Tommy is fascinating because you can see the moon moving. I watched in the quiet from my cousins’ backyard near Salem, so it was a lot of fun watching the Columbia video of you all excitedly working to get your photos. Then came the smiles of joy and relief when you saw that it had all come together. That was special–definitely a day to remember. Very much enjoy your other photos and videos, too–look forward to seeing more. 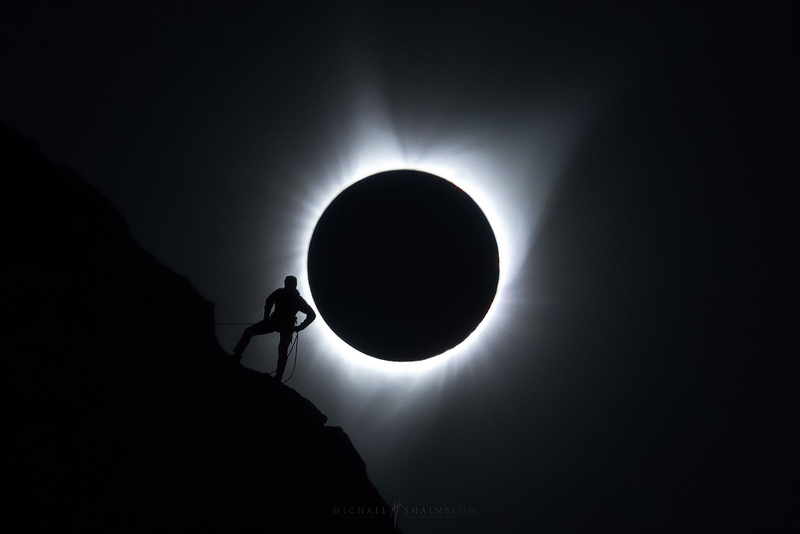 Hi Micheal, I’d like to use one of your photos (eclipse_moodcontrast.jpg) in my article in which 10 major astronomy events of 2017 are reviewed. I was invited by China Science Communications to write this article and the readers will be Chinese social network users. China Science Communications is a non-for-profit project, but I’ll be happy to share part of my remuneration with you for using the image as long as I can afford it. Thank you for contributing to human’s visual happiness of 2017! Please send me an email here shainblumphoto@gmail.com thanks!